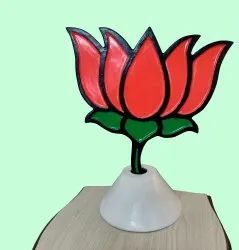 Pioneers in the industry, we offer congress 2d panja logo (white), congress 3d panja logo (white), revolving kamal bjp party symbol, bjp 2d kamal logo, bjp 3d kamal logo and 3d congress logo from India. The main purpose of this product is for the political promotion and can be used as the showpiece. This product is made up of FRP and it is highly durable and has a great impression. You can place it in the office, house or at the party karyalaya. Dimensions- Height-21 inch, Width-18 inch, Depth- 10 inch. Looking for political logo ?